A new feature! Exciting! I hope! What do you think of the name?! [Enough exclamations now?] [Ok.] This feature was inspired by Elena and Jen's features [Arts and Crafts] and [The Writings on the Wall] and in it, I am going to be highlighting a book I loved, creating a desktop wallpaper from it, and sharing the colour palette of the versions of the covers I like the most, and the colour palette of how I feel the book is represented to me in my mind. [If that doesn't make sense I'm not surprised, I'm terrible at explaining things but bear with me, and hopefully by the end of the post you'll get what I'm talking about!]. My first pick? This book, I couldn't rave about it enough. I don't normally read a lot of romance novels but I do enjoy novels dealing with grief and coming to terms with a death. So when I read this I expected to enjoy it. I didn't. I loved it. Completely, utterly and totally. I feel for Joe Fontaine, for Lennie 'John Lennon' for Big and Gram, Sarah [FLYING HORSES AND GIRAFFES] and the Spotted House Plant. I wish I could write like Jandy Nelson. If you haven't read this yet then I honestly think you should, even if this doesn't sounds like your sort of thing, give it a try. What harm could it do? Other than have yourself another horde of characters to pine and obsess over. Usually, during this feature's post, I would share a colour palette of how I feel the book is represented in my mind, not based on the cover. However, I chose this version of the cover because the colour palette was so spot on to the overall feel of this book. So instead, I'm going to do a little colour palette for some of the characters in this book. Lennie Walker [the main character], affectionately called 'John Lennon' by,: Joe Fontaine; and Lennie's best friend: Sarah, one of my favourite characters. NEED TO READ THIS! LOVED THIS POST! WHY AM I DOING THIS IN CAPITALS? You DO need to read it! AND THANK YOU! BECAUSE YOU'VE BEEN AROUND ME TOO LONG. I can't remember what the first YA book I ever read was! You have a good memory. :P ALANNAH JULIA HOW COULD YOU THROW OUT A HARDBACK OF THE SKY IS EVERYWHERE. Do you see this face? IT IS MAD. Why are your graphics so nice? Officially my new favorite feature that I will be following. I should try the book sometimes; sounds good! Thanks! You should try it yourself some time, and YES, read the book! Looking forward to the next installment of this cool new feature. Thank you! and RUBY. What. I feel like you would love it, there's extra little notes and journal entries in the book which I ADORE. Just --- get it from the library and THEN BUY IT IF YOU LOVE IT WHICH YOU WILL DO. Definitely an interesting feature, personally I love colours and I think this is a really unique way to portray characters/covers/books through colours because you can really identify feelings/emotions to colours. I have not read this book, but I have seen it pop up a few times, so I will definitely have to check it out! YES! Then tell me what you think. 3 DAYS LATER BUT I AM COMMENTING LIKE I SAID I WOULD. MEHEHEHE. So that's why you were asking about it *facepalm* I can't remember if that's the one I chose but I hope it is because reasons. ;D This is such a good idea for a feature - you creative thing, you. 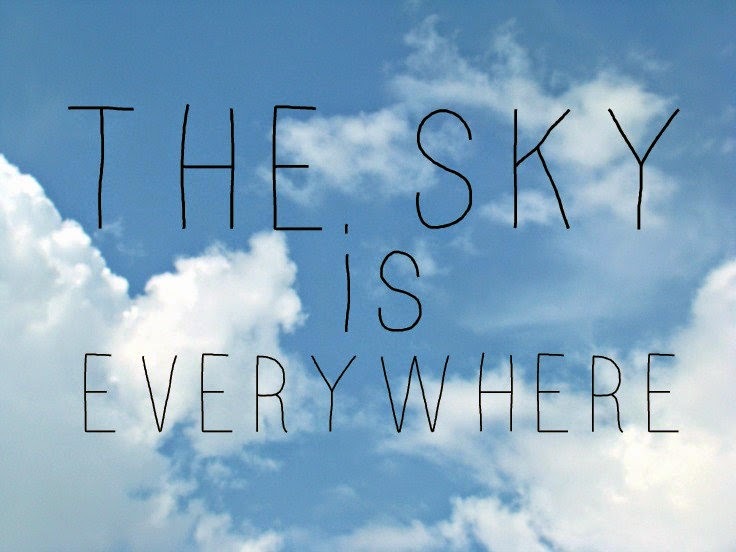 The Sky is Everywhere is BEEEOOTIFUL. *happy sigh* I read about 5 years ago so I need to own it and read it again. Soon. I've heard some good things about this book, glad to hear you enjoyed it! And this book palette thing you have going on? LOVE, so pretty and original!